“Missy, I need your prayers.” There was a slight pause. “Michael’s been in an accident on the bike. I don’t know all the details. I’m headed to the hospital now. Please, Missy. Pray. Just pray.” And she hung up. Just several months earlier, I had received a text from my friend Jennifer asking if we could meet. Jen and I were no strangers, but we certainly hadn’t had a close relationship. Things changed after my husband and I had given our lives to Jesus. 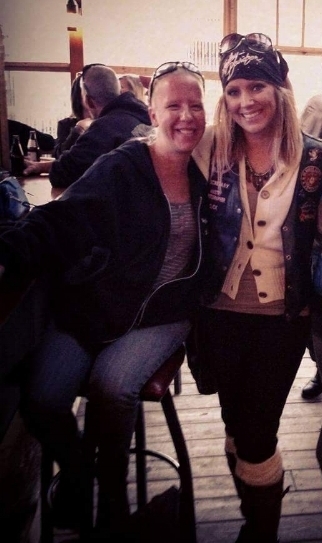 Jen and I were previous acquaintances through mutual friends, and had enjoyed each other’s company while out on the motorcycle, but we really hadn’t had the opportunity to sit down one-on-one and really get to know each other. When I received her text about hanging out, I was surprised for a couple of reasons. For one, we hadn’t been hanging out recently and I wasn’t quite sure my husband and I were likeable after so much about our lives had changed. Secondly, we hadn’t been the closest of friends in the first place. Surprised, I responded to the text that I would love to get together with her and catch up, especially because I was so intrigued that she had reached out to me. The day she came over I answered the door with a smile on my face. I gave her a hug, took her coat, and offered her some coffee. I welcomed her to sit on the comfy brown leather couch next to me, and told her how surprised I was to hear from her. At first it was awkward, and we didn’t have much to say. I managed small talk over our coffee and made it a point to be cordial. But then, I decided to cut to the point. From there, I shared my story with her. A story of heartbreak. A story of chasing and running after anything that made me feel good or kept me company. A story of alcohol and partying, fights and screaming. A story of wanting so badly to be loved and adored, but feeling like such a failure at everything I did. A story about how our lives started to change when we started to read what the Bible said and learn about who Jesus was. Our eyes were opened and we slowly started to understand how much God loved us despite who we were or what choices we made. That love started to change us. I recognized, over time, how I had been selfish and stubborn. Slowly, by God’s spirit, my husband and I started to be more patient and more kind. We started to consider one another’s feelings before our own. We started to pray, A LOT. And over time, we started to see the dynamic of our lives changed. There was peace. There was true joy. There was a hope that outweighed the circumstances thrown our way. And that hope was apparent, and that light drew people to want to know what had changed. People Like Jennifer. After our meeting, Jen and I started to go to church together. We prayed for her fiancée who wasn’t yet ready to come to church, and I bought her a Bible all wrapped with a shiny pink bow. I texted her during the week to check in and see how her week was going. I was starting to see hope and faith in Jen’s life. I had done everything a “Christian” was supposed to do, and on paper, I was beginning to look like a pretty good friend. As I hung up the phone and scrambled to collect my thoughts, I searched frantically for my mom. Once I found her, I hurried the gals to make their final purchases so we could rush home and deliver the news to my husband. Three of my friends were being rushed to the hospital in a motorcycle accident. And one of those people was Jen’s fiancée. I’ll spare you the details of the accident for her privacy, but being a friend changed for me the day my friend lost the love of her life. Each time Jen and I talked, I scrambled to find fitting words that would land on a freshly broken heart. Every time I pressed send, I thought about how my words would make her feel and what they would make her think. I analyzed every word in detail, feeling the weight of all that I spoke to her or texted. The time between our visits/check ins started to grow larger. What do you say to someone who has to start all over again? How do you mend a broken, bleeding heart? Looking back on the past year, I can’t say I did everything right. As a Christian, I am well aware of the way the Bible talks about loving others. I know what Jesus has done to love me, and I can’t even begin to say that I matched that love for my friend. There were a million times I thought about her. There were a thousand times I prayed for her heart. There were a hundred times I felt discouraged that the seat next to me at church was empty. But I learned a lot about love because of my beautiful friend Jen. I learned that love isn’t loving someone because it’s convenient. I learned that love isn’t loving someone because they meet your needs. I learned that love isn’t easy, it can be tricky, and that true love comes with failures. And I also learned that love IS holding a hand when your whole world is breaking. Love is hugging a chest containing a fractured, severed heart tightly and not letting go. It is loving someone whether they show up or don’t, whether they care or they can’t. I'm thankful that Jen has been so patient with me as I learn to love someone in so much pain. I feel incredibly blessed that God has used her in my life to show me so many ways I need to love bigger and better. There is such a strong connection in our friendship—knowing that neither her nor I are going anywhere—that we plan to navigate this pain together, whether we understand it or not. The biggest thing I've learned in Jen's pain is that at the end of the day we just want people to share our pain. People who will roll their sleeves up, get dirty, and say, "Where do we start?" People who are willing to do life with you no matter how deep the trench is and aren't afraid to love you in your messy, broken life. People like Jesus.